City Theatre is opening their 39th season with the production of Vanya and Sonia and Masha and Spike through November 3, 2013. 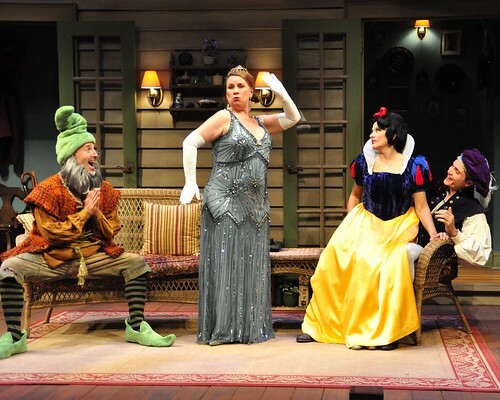 Vanya and Sonia and Masha and Spike was the winner of the 2013 Tony Award® for Best Play and was written by Christopher Durang and directed by Tracy Brigden. Greg and I were invited to attend press night – and it was also our first time to visit City Theatre. When I first went out to the City Theatre website, I took one look at a preview photo and anticipated we’d be laughing our way through this play – a great date night fit for us! We were right. The story begins on the porch of the house Vanya, Sonia, and Masha grew up in, the house where Vania and Sonia cared for their elderly parents through death…and never left. On this day, just like any other day, they are looking for their good omen, the blue heron that frequents the pond behind their house. The pair (brother and adopted sister) eventually argue over coffee and Sonia dives into a “woe is me” phase that I just couldn’t help but identify with. Five minutes in, I knew the play was going to speak to us somehow. Movie star sister Masha shows up with her (young) boy toy Spike and the hilarity begins. The family dynamic, the jokes, the reality of it all had me in a good laugh for most of the play. If you ask Greg, he might tell you my favorite parts were when Spike had his shirt and pants off, but he’s wrong (although his “reverse strip tease” is definitely something to be seen, ahem). Throughout the weekend, housekeeper Cassandra warns the family, “Beware!”, foreseeing omens of trouble ahead. (Amirah Vann captivated me in this role – she was definitely a stellar pick for the role. Facial expressions, muscle movements, and tone all made her a perfect fit.) And there is trouble ahead-regarding the family home that Masha pays the bills on. And ah, yes. Nina (the woman in the lower right). The neighbor’s niece, Nina runs into Spike while he’s out at the pond (Greg much?) and returns with him to meet Masha. She is an aspiring actress and ends up helping Vania share a big secret that he’s been hiding (more on that in a moment). Following a night at a neighbor’s costume party, Vanya, Sonia, and Masha’s lives begin to change. They realize they are in their fifties and life just isn’t the same as it once was. For Masha, it’s been 5 failed marriages. Sonia’s led a lonely life and has hope that perhaps one day her prince will come. And Vanya, sweet “Uncle Vanya” (as named by Nina). He’s been in the shadows of a dramatic family all of his life and deserves a chance to speak his mind. And Vanya gets that chance when Nina’s reading of the part of a molecule gets interrupted by Spike’s millennial multi-tasking. Actor Harry Bouvy presents a stellar monologue tirade about how generations do not understand each other and how things are so different now than they were back then. Greg and I kept whispering, “incredible!”, “amazing!”, and “wow!” throughout what must have been five minutes of Vanya having his moment. It truly was incredible, and I can’t really find another word to describe the part of the play I most identified with (specifically because this scenario may very well have recently happened in our lives). Playwright Christopher Durang peppers references to characters and themes from Chekov, but it’s not necessary to understand Chekov’s work before you go. Trust me, you’ll still find yourself laughing out loud, perhaps shedding a tear, and identifying with someone in the play. Greg and I have never been to a play together (okay, besides a kid’s play), and as we were seated talked about the last time we’ve been. It’s been all too long for both of us, and time we start scheduling more nights on the town like this. We may not have been theater majors, not fully understanding the references, lighting, costumes, and other aspects that others around us were watching for, but we had an amazing time. Pittsburgh’s quite lucky to have gotten their hands on this play that just left Broadway a few months ago. Congratulations to director Tracy Brigden and the entire cast of Vanya and Sonia and Masha and Spike! Weekday matinees will be performed on Wednesday, October 23 and Wednesday, October 30 at 1pm. There will be no evening performance on Wednesday, October 30. Parking: (Because I always fret about this) Arrive early. There’s a lot just down the street from the Theatre with $7 parking, but it’s limited. Get there early, enjoy the lounge or the courtyard. There is no late seating, and you don’t want to miss this. This entry was posted in Pittsburgh Fun and tagged City Theatre, play. Bookmark the permalink. SO Jealous of your media night invitation! Mr. Beez and I went this week and absolutely loved it. What a great show!